It’s a win in my book! While it may technically be second place again, an 82 point merit print is another good effort for my second time in print competition. 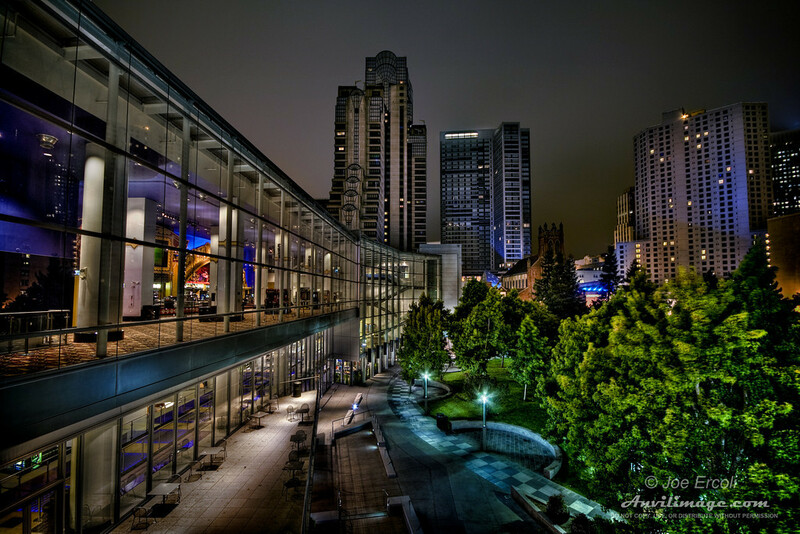 I went with the HDR above that I shot on a balcony overlooking Yerba Buena Gardens and the back side of the Metreon in San Francisco just about a block away from the SF Museum of Modern Art. You can read the original post about that pic (and see related images) here. My hardest task for this print comp was not picking which print I wanted to use, but coming up with a descriptive name for it! After brainstorming for days and only coming up with a drizzle of thoughts, I reluctantly renamed it “Asleep With the Light On.” Have a better idea for a title? Put it in the comments below! This entry was posted on Friday, March 19th, 2010 at 1:13 pm	and is filed under Blog, News and tagged with HDR, print competition, San Francisco. You can follow any responses to this entry through the RSS 2.0 feed. A forest within a jungle. It’s a brilliant piece. Did you alter the sky or is it’s lack of depth due to light pollution and overcast? That night the cloud cover was hanging at a pretty low altitude. I was surprised the tops of the the buildings weren’t more shrouded in fog. Thanks for your comment! I enjoy looking at this image. I retired last year from 40+ years of commercial/industrial/catalog photography and am getting revitalized from some of the pleasing images I am coming across. For years I have been somewhat stifled by the demands of my clients, but images like this are a jolt to my creativity. At 76 I am being inspired again…who would have thought it. My website is still active even though I shut it down, but I don’t know how long it will run. Very nice work.